In our home we have lots of hardwood floors. We love hardwood floors more than any other floor covering out there. As a matter of fact almost all of our 3,000 square foot home is covered in hardwood flooring. But if I am being honest, it isn’t easy for this country-living, dog-owning military wife and homeschooling mom of 3 to keep the hardwood floors clean. As a matter of fact, I actually began to dread cleaning them! I dreaded it to the point that I began to go for extended periods of time without deep cleaning them because it was such a daunting task! I had tried many, many different products trying to cut down the amount of time it took me to effectively clean my hardwoods. I have also tried many techniques that promised to give me the fresh, clean look I was so desperately trying to achieve. But they failed me. All of them. I began to settle and that is when I really began to dread cleaning the floors (as I mentioned above). Just as I was about to give up, I came across the Bona® PowerPlus system! Bona PowerPlus is a phenomenal, easy to use system that delivers deep cleaning and a beautiful shine to your hardwood flooring (I’ll show you a before and after in a bit). The Bona PowerPlus is Bona’s most powerful cleaner yet. and it’s just in time for spring cleaning! So after using so many different types of daily cleaners for my wood flooring, I was a little skeptical to try something new. I am super happy to report that it took me less than 10 minutes to clean all of our high-traffic areas using the Bona PowerPlus microfiber floor mop, PowerPlus hardwood floor deep cleaner, and the PowerPlus microfiber deep clean pad (all pictured above). With these tools I was able to achieve some great results. You can see from the before and after photos below, just one pass through with this powerful system made a world of difference! And the best part? I’m able to throw it in the washer to reuse it when the next round of dirt-dragging occurs from our sons and dogs, saving me time and money! What a difference! Just for reference, this area is right near the entrance into the house from our courtyard area. This is where our two youngest sons are always running in and out from playing outside. They are always dragging in dirt from the field and wooded area on the property, not to mention sap from climbing trees! And this is also where our two busy Standard Poodles come in and out of the home and it is common to find them slurping their water on the floor leaving many “spots” where dirt/dust collect (just like the middle-left section of the before photo). And of course my husband, teenage daughter, and myself come in and out of here as well. And this, my friends, is why I so desperately searching for something to help me in my quest to keep the hardwood floors looking good that wouldn’t take hours to clean! This momma couldn’t be more happy now that I’ve found a solution that will save me both time and money as well as make my house look good! 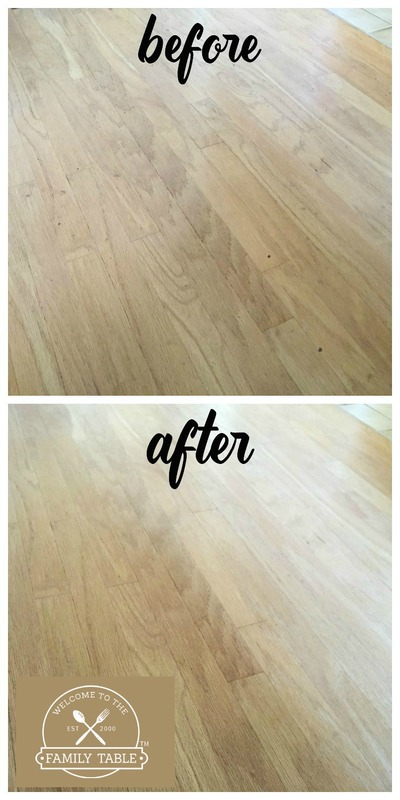 Could you use a simple solution for deep cleaning hardwood floors at your house or office? If so, I highly recommend giving the Bona PowerPlus system a try! You can find the Bona PowerPlus system at Lowe’s, Bed Bath & Beyond, ACE Hardware and True Value. Be sure to enter the Bona PowerPair Sweepstakes! Bona is hosting the PowerPair sweepstakes to highlight the power of their new PowerPlus deep clean system. Enter to win the amazing grand prize (listed below). 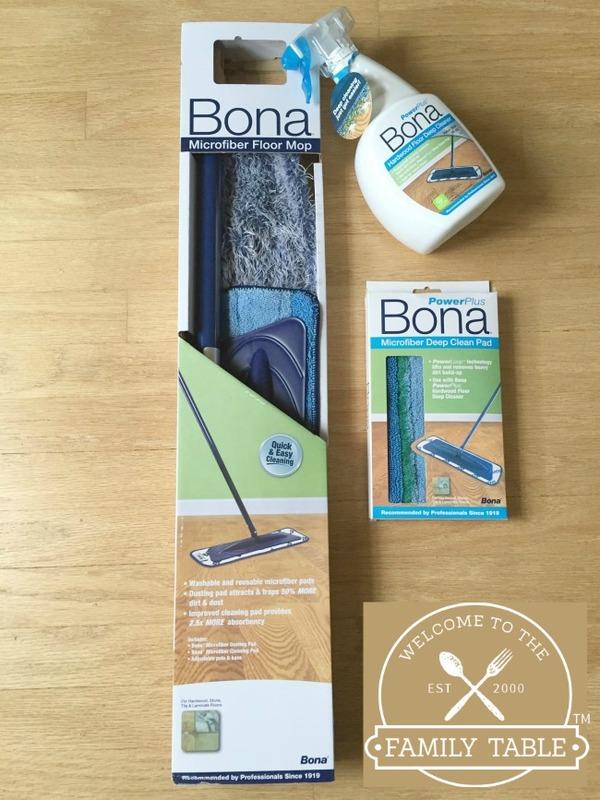 Additionally Bona is offering 100 INSTANT WIN PRIZES by playing the PowerPair Match Game to win a Bona Hardwood Floor Mop and a $25 VISA® Gift Card. As an extra bonus, upload your receipt for a $5 Starbucks® Gift Card when you purchase two Bona Products, like the Bona PowerPlus Hardwood Floor Cleaner and Bona PowerPlus Microfiber Deep Clean Pad. Don’t delay! Be sure to enter the Bona PowerPair Sweepstakes today!